We’d love your help. Let us know what’s wrong with this preview of The Fireside Grown-Up Guide to Mindfulness by Jason Hazeley. To ask other readers questions about The Fireside Grown-Up Guide to Mindfulness, please sign up. One of the other mainstays of my early reading were Ladybird books, particularly the history series many of which were written by a gentleman with the curious surname of du Garde Peach. Anyhow all these books had the same format, small hardbacks, text in a large friendly font on the left hand page with a full page colour illustration on the right hand side. They covered a variety of subjects in addition to history, I had Ladybird bird books on Conversation, the Telescope (I'm not sure if the mic One of the other mainstays of my early reading were Ladybird books, particularly the history series many of which were written by a gentleman with the curious surname of du Garde Peach. Anyhow all these books had the same format, small hardbacks, text in a large friendly font on the left hand page with a full page colour illustration on the right hand side. They covered a variety of subjects in addition to history, I had Ladybird bird books on Conversation, the Telescope (I'm not sure if the microscope was included in the same volume or if was allowed to be a big enough subject to warrant having a book by itself, the Human Body and so on and so forth. I suppose they were all aimed at early readers - the pictures were a meal enough by themselves and I can remember some of them without effort even now. Well naturally with the coming of the internet providing your own humorous text to go with some of those pictures was a diverting pass time for many of my generation or thereabouts. I think there was an attempt by a woman to publish her own book recycling old Ladybird illustrations in that way and once the dust of court action eventually settled the publisher who currently owns the rights to Ladybird books (view spoiler)[ Warning! This may not be the same publisher by next week, there's probably a Ladybird book that explains how the publishing world works (hide spoiler)] realised there was some money in the concept and lo, it came to pass that Messrs Hazeley & Morris wrote a series of light-hearted Ladybird books for adults on useful subjects such as the Hangover, the Mid-Life Crisis, as well as the alleged subject of this review, among others making use of the full range of illustrations from the original Ladybird books. My first reaction was that I found the joke on page 24 funny. My second was that the publishers had missed a trick by not writing serious books on these topics for adults in the same format. My third that the other jokes were not as funny. Although in anycase you can always look at the illustrations and tease your memory until you remember in which book it was first used. Perhaps at this stage I ought to mention that I have only been practising mindfulness for two years (view spoiler)[ almost (hide spoiler)]. It's hard work, as I notice when I find myself scoffing food rather than paying attention. There's an awful lot that you can pay heed to. Recently I was on a station platform, it was a winter morning, I was reading, probably Romantics, Rebels & Reactionaries, drinking a double espresso which tasted of dark flowers (view spoiler)[ admittedly I do slosh the liquid back and forth around the mouth to get this effect (hide spoiler)] , at the same time it was becoming lighter, the sky and clouds a mixture of purples and blues, varieties of birds were singing across each other, there were gaggles of schoolchildren not reading, outcrops of adults travelling to work, people working like the man in the coffee booth who stopped the coffee machine prematurely and in my imagination depriving me of a couple of seconds worth of espresso. Of a sudden it was overwhelming, and with apologies to Mrs Butler (deceased) who wrote the marvellous text I was devouring, I snapped the book shut for a bit. Alison has been staring at the beautiful tree for five hours. In this way, mindfulness will have solved her work-related stress. I grew up with Ladybird books and my children had many also. This short and quick read is part of a fun series for adults and quite frankly, they’re an absolute riot. The illustrations are the same classic ones from before and seeing them was pure nostalgia. Christmas prezzie - hubby knows me well! Nice nostalgic feel from a childhood filled with Ladybird books, several of the illustrations are familiar to me. Like the originals there is a page of large print then a classic picture page to accompany it. Unlike the originals this is geared to adults, filled with wry but gentle humour. Nothing overstated, plenty to raise a grin. While I'm equally thrilled with my adult-colouring-book the latest push for 'Mindfulness' amuses me, I don't need a backpack a Christmas prezzie - hubby knows me well! I grew up with Ladybird books and so did my children. We all loved them. Feeling nostalgic, I thought this adult version would be a nice thing to try. It's part of the "Ladybird Books for Grown-Ups" series in the UK or the "Fireside Grown-Up Guides" in the US version, now published by Touchstone. (Thank you very much to them for providing me with a copy via NetGalley). The books combine the classic pictures with small amounts of text explaining our confusing world to grown-ups. Very relevant in I grew up with Ladybird books and so did my children. We all loved them. Feeling nostalgic, I thought this adult version would be a nice thing to try. It's part of the "Ladybird Books for Grown-Ups" series in the UK or the "Fireside Grown-Up Guides" in the US version, now published by Touchstone. (Thank you very much to them for providing me with a copy via NetGalley). The books combine the classic pictures with small amounts of text explaining our confusing world to grown-ups. Very relevant in these times. Well, this was a treat, a funny and cool treat. I loved the artwork, cool old school vintage art, the different kinds of mindfulness were extremely entertaining and very tongue in cheek. As the book says "Mindfulness: the skill of thinking you are doing something, when in fact you are doing nothing". Oh look at me bring all mindful as I sloth around on the couch contemplating, finally the excuse I've always needed. A great laugh. These seem to have started turning up in charity shops now - even more places to read them in full under cover of browsing! Genius! Quite possibly the best five minutes reading I've had in ages. I laughed so hard I cried, especially at page 46. Not just a series of gags, this gem is an incisive piece of social commentary. Deserves regular reading. Wendell achieves a state of mindfulness by imagining he is floating in a beautiful lake until his mind empties of everyday worries. Soon he is aware of himself, but no longer worried about money, work, family or whether he left the taps on. Many home insurance policies now cover Acts of Mindfulness. 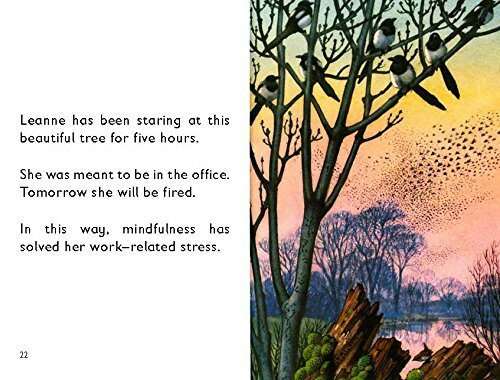 'The Fireside Grown-Up Guide to Mindfulness' by Jason Hazeley and Joel Morris combines classic book illustrations with funny captions. Like the other volumes, I had mixed reactions. The captions are told in large fonts. They are a little funny. Where the humor comes in is with the classic illustration that has been found to match up with the text. Some of the pictures seem idyllic or fantastical, like a chair being pulled by swans or a beautiful woman painting in a window. Some are mundane, like 'The Fireside Grown-Up Guide to Mindfulness' by Jason Hazeley and Joel Morris combines classic book illustrations with funny captions. Like the other volumes, I had mixed reactions. The captions are told in large fonts. They are a little funny. Where the humor comes in is with the classic illustration that has been found to match up with the text. Some of the pictures seem idyllic or fantastical, like a chair being pulled by swans or a beautiful woman painting in a window. Some are mundane, like a man working on a huge duct in a factory, or a drab building. The illustrations are all from Ladybird Books. I didn't grow up with those. Perhaps if they'd used illustrations from Golden Books, I'd be more nostalgic about the series. The captions are marginally funny. Occasionally one really stands out. These would possibly be good gift books for someone who grew up with Ladybird Books. Years ago as a child I read ladybird books, this version for adults has the same style of writing with the corresponding picture but did make me smile. People learn a lot about themselves from mindfulness. Mindfulness has taught Django to live in the moment. He used to live in the peak district. The book also advertises other books in the series which don't exist, but sound like fun Years ago as a child I read ladybird books, this version for adults has the same style of writing with the corresponding picture but did make me smile. Didn’t get it, I didn’t find it funny at all. This was a huge miss for me. This is short, sharp and very funny. I grew up with Ladybird books and they were very much a staple part of my childhood. Fast forward and I find myself reading them again, although this time they are very different. Instead of a well loved fairytale Ladybird book we now have a series that is written for adults and they are entertaining, sometime satirical but always funny. This book looks at mindfulness. Mindfulness to me is a kind of meditation and it has a growing popularity but as with all tha This is short, sharp and very funny. I grew up with Ladybird books and they were very much a staple part of my childhood. Fast forward and I find myself reading them again, although this time they are very different. This book looks at mindfulness. Mindfulness to me is a kind of meditation and it has a growing popularity but as with all that is new and trendy, it can seem rather ridiculous especially when the meaning is lost or it just becomes another fad. 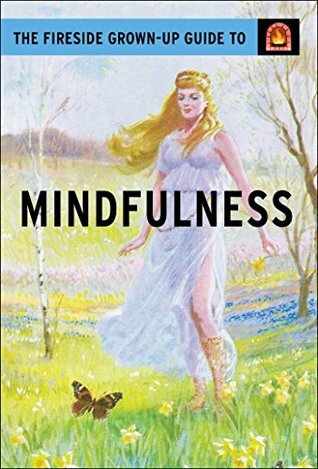 This very short volume pokes fun at the kind of mindfulness that is a buzz word and it does so using short, witty observations and images which have a Ladybird book style. Very amusing for anyone who has an irreverent sense of humour. My fifth and final book in this series today, well worth the twenty-odd pounds it cost to get them here this morning to cheat my way to victory on the yearly book count! This edition is about the topic of Mindfulness. No I don't know what that actually is either. Mindfulness appears to be about clearing your mind of problems and entering a state of peaceful calm and tranquillity. I think it seems quite similar to being a pretentious prick. Jane has tried many ways of energising and detoxing. She went on a raw food diet, but the chicken made her very poorly. Then her tutor told her to "be like water". Jane thought this was a good idea. Now, just like water, she is drunk most lunchtimes. This was a very long and hard book to finish. I found myself staring for seconds at a time at each page, taking in the details of the image and the meaningful philosophy of the words. Well worth the 15 minutes it takes to read and then read again out loud to anyone who's within earshot. As somebody who does use mindfulness techniques, I found this to be refreshing and funny. Great to read when you are not in the mood for faffing. Ridiculously witty and laugh-out-loud funny, it's laden with irony and humour. There's a pun on every page. I thoroughly enjoyed reading it! Made me giggle and Poole (where I'm from) even got a mention. This is a hilarious and fun series of books about how dumb being a grown-up is. That's a gross oversimplification, but it's still true. And they're still hilarious and fun. I'm curious if the pictures were found and the stories written around them, or if the pictures were made for the book. It's more fun if it's the former. This book on “mindfulness” (trying to live in the moment) is written in a childish format. I found this book mildly amusing - a few ironic smiles rather than any proper laughs. Overall 2.5 – one to borrow from the library rather than buy.